Well, it seems that the polar vortex has decided to visit quite a number of places here in the lower 48 states, forcing many of us to remain indoors for several days. And what better to do than to celebrate that with a bit of hygge? As a reminder, if you are staying in, you can remain in your hyggebuskars (cozy pants that you never wear out of the house) and enjoy some homemade soup (using my recipe or your own) or a hot toddy. And, of course, there are tips for how to establish hygge in your home. And yes, I quoted Admiral McRaven in that last link. This week, I’m following the core idea of hygge, which I discussed in this post, which I entitled “A little more conversation, a little less action.” I’m spending some time with folks I love and being a lot less present online (at least when they are with me) and a lot more time focused on the moments. And, of course, I’m painting my heart out. Quote from “Grasshoppers” by Mary Oliver. I am still enjoying keeping things cozy on this cold winter month—lots of cuddling with my husband (and our cat), and reading, and artwork in my studio. I’ve started the process of learning how to paint with watercolors, and while playing with them to start to figure them out, I created a series of watercolor hearts on cold-pressed paper, which decided to grow up and become Valentine’s Day cards. Here you see the first four I made, though there are now about a dozen, and I plan on making some others this week just because they are fun and pretty and help me learn how watercolors work. These will be going with me to the Valentines Pop-Up Market on Saturday, February 9th at Creek Mercantile in Rancocas Woods, Mount Laurel. Each original artwork is mounted on a kraft paper card, which comes with a matching envelope—perfect for the one(s) you love! This week, I hope to start painting flowers, in order to take part in a flowers for February campaign on Instagram, so wish me luck . . . as I said, I’m super new at working with watercolors! Meanwhile, there is cold weather and maybe even a bit of snow in the forecast, so we shall continue our focus on keeping things hyggelig around here. What has been your favorite way of injecting a bit of higgle happiness into your life? One of my favorite people to have a conversation with — seen here at Mona Lisia, a favorite restaurant. Seen here in this photo of my sweet husband Morris: dinner, soft(ish) lighting, candle on the table, delicious food (mussels in red sauce—and if you get to Mona Lisia Restaurant in Williamstown, NJ, they are SO WORTH IT). And yes, I took this photo using my cell phone, but other than that, the phones were put away. And that is entirely intentional, so that we can focus on one another and on our conversation. It allows us to be in the moment with one another, and that, my friends, is what hygge is all about. If that sounds like some of the same sorts of advice you’ve heard on fostering relationships, or on intentional living, that’s no accident. And it’s no wonder that hygge help people to live happier lives. If hygge is about comfort, coziness, and mindfulness, then homemade soup seems to me to be a hyggelig food. After all, it requires mindful chopping of ingredients, and its slow-cooked goodness provides lots of warmth and comfort, as well as whole-food nutrition. I’m happy to share with you my own recipe for minestrone, which is really my take on vegetable soup. I patched it together a few years ago after referencing quite a number of recipes, and it is consistently good. Heat olive oil in Dutch oven or large pot over medium-high heat. Add onion and cook until translucent. Add garlic; cook 30 seconds. Then add carrots and celery and cook about 5 minutes until they start to soften. Stir in tomato paste, then add zucchini, tomatoes, potato, herb, and liquid. Bring to a boil, then simmer 10 minutes. Add cabbage and pasta, and simmer 10 minutes more. Stir in chick peas or beans, then heat about 2-3 minutes longer. Top with grated Parmesan cheese (if desired) and serve. It’s especially good when served with bread and butter. HYGGE (pronounced somewhere between HOO-guh and HEW-guh) is the Danish word for a sort of mindful coziness. Now, I’m a word geek who absolutely loves things like etymology (the history of words and their meanings), and the background of the current Danish word is fascinating. 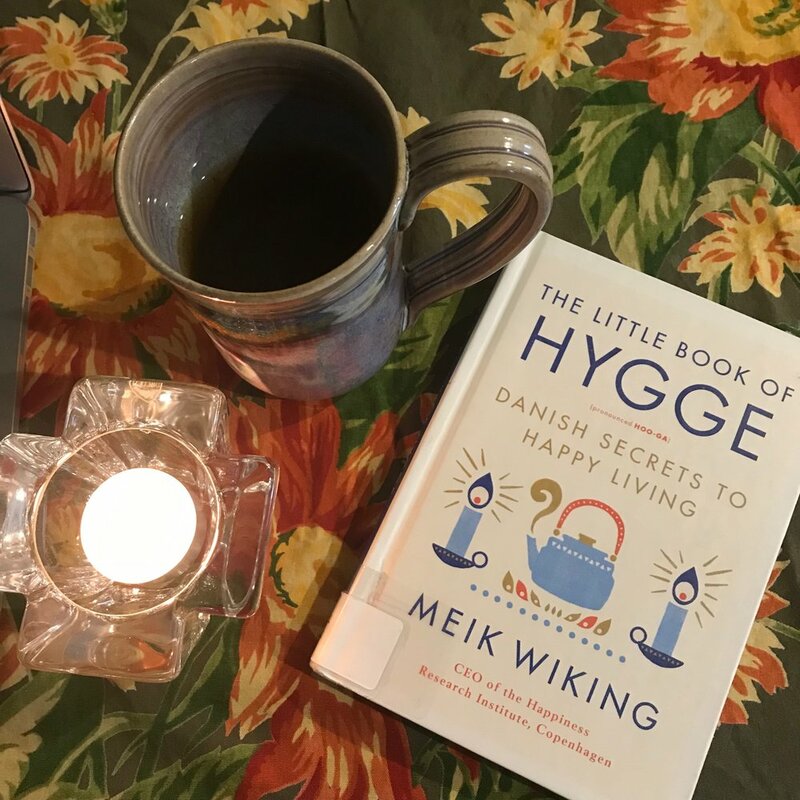 The word hygge derives from an old Norse word that is about comforting, and is related to the Old German word that came over into English as “hug”. Kind of fun to know, especially when you are trying to get a handle on the concept. First, tidy up a bit. Maybe you have been binge-watching Marie Kondo’s “Tidying Up” on Netflix, or have read her book, The Life-Changing Magic of Tidying Up, in which case this idea may already be on your radar. Or perhaps you read my earlier blog posts about decluttering, including this one from the end of October entitled “Creating Space for Abundance.” I’m not telling you to get rid of your favorite things (those stay!) or to clear your bookcases (heaven forbid — though weeding out those books that you don’t like or that make you feel bad about not loving them is a great idea). But having a bit less stuff allows abundance into your life, and also allows you to relax so that you can feel a sense of hygge. One tip that works super well, and that has helped some friends of mine as well, is to find one space in each room to keep clear and tidy, to give your eye a place to rest. It helps even if it is a small piece of furniture, but it’s super soothing if it’s the largest thing in the room. For instance, a made bed in a bedroom (without stuff piled all over it) gives your eye a place to rest. And as Navy Seal Admiral McRaven says in this speech (which has gone viral and also become a small book), it will give you a sense of purpose and achievement. If you can keep the dining table clear, the dining room will seem okay. Same goes for the island in your kitchen, or at least a stretch of countertop. Second, organize your stuff. If you have massive piles of books all over the place, consider obtaining a bookcase and corralling those books in one place. If you (like me) have Serious Paper Issues involving mail and articles that you intend to read but haven’t gotten to yet, figure out (a) where to keep them and (b) if there is an organizational device that would work for you. For some people, a set of mail bins is super helpful; others prefer a few folders; still others are fond of binder clips, or boxes, or a file system. Quite seriously, I’m best with piling stuff in one place on my desk and scheduling time to go through it each week, then filing the stuff I need to keep and recycling everything else. And I would argue that forking out a lot of money on boxes, baskets, bins, and folders that just contribute to your stress and/or clutter level makes no sense (no matter how tempting those Container Store catalogs look, if you won’t actually use the things you buy, you will just end up with more stuff to manage). A hyggelig moment in my living room. Third, allow yourself to relax and enjoy your space. Introduce cozy elements such as lit candles, an afghan, or other comforts into your living space. Take time to enjoy and appreciate your space, and to enjoy and appreciate your day. Make your favorite tea or coffee or (if you’re an adult) open a favorite bottle of wine or beer. Spend a bit of time having an actual conversation, in person or by telephone. You can always use some of the suggestions from this post about celebrating the little things in life. If you are starting to see a trend in these posts, I hope it is that these many suggestions about how to live a more positive life dovetail and overlap. Tidying up is good for creating comfort (hygge), but also it’s good feng shui, and it helps reduce stress (since you can find things when you want them and your things are no longer taunting you by being in disarray). This month’s theme is hygge, which is all about feeling comfort and warmth (in the emotional sense, at least). 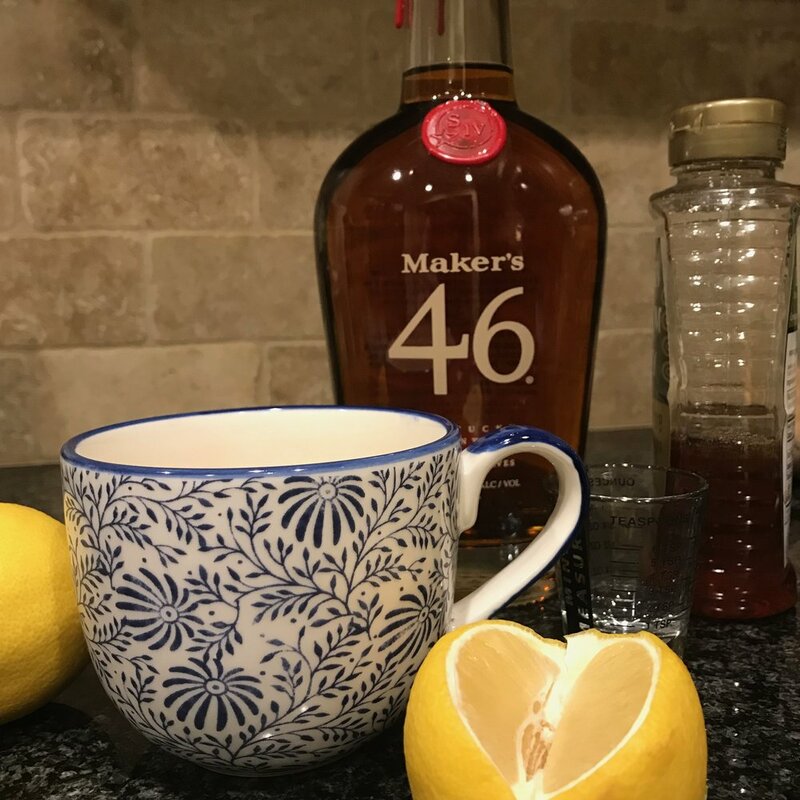 I remain in the throes of rather nasty upper respiratory virus, which is apparently some sort of three-week cold that’s going around, and one of the things that helps to loosen the tightness in my chest and sooth my throat after coughing is a good, old-fashioned hot toddy. Coat the bottom of your mug with honey. Add the juice of 1/4 of a lemon. Add 1-2 ounces of brandy, cognac, bourbon, whisky, or even rum (that’s 1-2 ounces of alcohol total—not of each!). Then fill the mug with hot black tea or hot water. Stir and sip. This is a super soothing beverage on a chilly or damp day, and has actual medicinal properties if you are feeling under the weather. If you cannot have alcohol or are serving this to a child, just omit the spirits: the hot tea or water with lemon and honey is still soothing and tastes good. Or, to use the Danish term that better encompasses the precise idea of coziness that I’m referring to, this month is all about hygge. I’m defining hygge in brief as “a sense of cozy well-being; feeling present in this moment”. My hyggelig work area at the dining room table. A favorite tablecloth, tea in a favorite mug, a candle, and a book. It is a feeling, not an object. As a result, it’s something you create, not something you purchase. It can be as simple as mindfully enjoying a cup of tea or coffee in your favorite mug while focusing on the warmth it brings you. Or sitting down at your kitchen table with a lit candle and book. The Danes are consistently rated as among the happiest population on the planet, and hygge is part of the reason why. It is about comfort and connection with others, and there is much to commend it. So look for a few blog posts each week this month on the topic, and if you’re interested in getting the info delivered straight to your email, sign up for my email newsletter (no spam, just emails about living a positive life).